Many people take the time on Veterans Day to reflect on and appreciate the sacrifices made by members of the military to protect American freedom. The holiday is also a perfect time to learn more about senior benefits that are available to older veterans. Benefits from the U.S. Department of Veterans Affairs (VA) include medical services and programs to offset the cost of assisted living for veterans. In addition, it offers support programs and resources for caregivers. According to the VA's official website, a senior is eligible for VA benefits if they served in the active military, naval or air service or served as a Reservist or National Guard member called for active duty. In addition, the veteran must have been honorably discharged or released. Veterans are able to receive basic medical care through the VA medical benefits program. This care includes inpatient hospital care, hospital emergency room services, outpatient hospital and doctor services, mental health and substance abuse care, preventative care and medical supplies. If a veteran is eligible for a pension, he or she is also eligible for the Aid and Attendance program, a benefit that is paid to the veteran in addition to a monthly pension. This tax-free money can be used to pay for long-term care in a senior living community or on assisted living for service members and their spouses when they cannot pay for these services themselves. While Veterans Day is a time to celebrate these American heroes for their service to the country, it is also a time to celebrate those who are providing care to retired patriots. 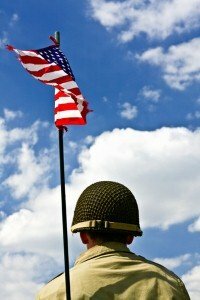 Caregivers of veterans face unique challenges, according to the Family Caregiver Alliance. In addition to caring for any injuries or disabilities incurred from the veteran's service, these caregivers also often deal with psychological after-effects that combat has had on the service member such as post-traumatic stress disorder or issues caused by a traumatic brain injury. In addition to offering helpful services to veterans themselves, the VA offers services that can help caregivers as they manage their loved one's health. The organization offers a caregiver support line that provides assistance over the phone. There is also a Caregiver Support Coordinator, a licensed professional who can help caregivers by matching them with VA services that they and their loved one are eligible for.